We're one step closer to near-limitless clean energy. A team of scientists determined to “fetch the Sun’s fire to Earth” just got closer to achieving their lofty goal. 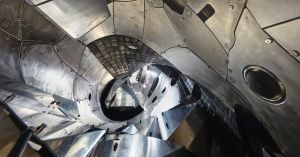 From July through November, physicists at the Max Planck Institute for Plasma Physics (IPP) conducted their second round of experiments using the Wendelstein 7-X, a device designed to test out a way to generate stable nuclear fusion on Earth. On Monday, the IPP announced the results of that testing — data showing that the reactor already broke several world records. When the nuclei of two atoms combine, it produces an enormous amount of energy. We call this nuclear fusion, and it’s the process by which the Sun generates its energy. Researchers want to find a way to replicate this process on Earth, as it would provide a near-limitless source of clean energy. A key part of the process is figuring out a way to manipulate plasma at extremely hot temperatures. Some researchers are attempting to do this using donut-shaped devices known as tokamaks, but the Wendelstein 7-X is a different type of device known as a stellarator. These devices move plasma along a route containing twists and turns that, in theory, make it easier to keep the plasma stable. According to the IPP announcement, the Wendelstein 7-X produced record high values for both plasma density (2 x 1020 particles per cubic meter) and plasma energy content (more than 1 megajoule). It also achieved the longest plasma discharge time on record for a stellarator (100 seconds) and a plasma temperature of 20 million degrees Celsius (36 million degrees Fahrenheit). These figures all point toward the same conclusion: The IPP is making significant progress towards its goal of replicating the process powering the Sun here on Earth.